As Luffy advances across the bay of Marineford to save Ace, the Whitebeard Pirates come to his aid in a no-holds-barred clash with the Navy forces. Just when the brothers make a mad dash toward freedom, Ace turns back to lend Whitebeard a hand, refusing to leave him for dead. But before he can reach his destination, Akainu appears to test the might of his magma against the flames of Fire Fist Ace. 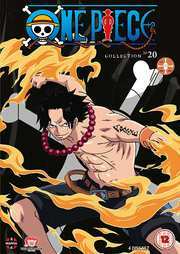 One Piece Collection 19 contains 469-491.